We believe that dinner is so much more delicious, when you are surrounded by style. This modern dining room might look modest, but it’s far from being just black and white. 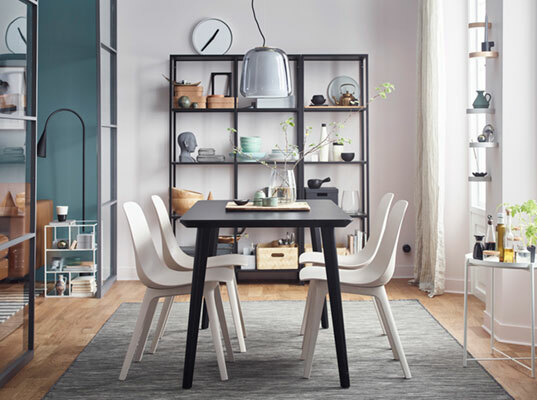 Read in between the lines and you’ll find real Scandinavian design icons, such as LISABO wooden dining table (it is easy to assemble without any tools), ODGER chairs made of recycled plastic and wood, and VITTSJÖ storage combination made of metal and tempered glass. This dining room in a big family house is a great a modern interior example. The MÖRBYLÅNGA dining table made of oak attracts the eye and gives a natural expression to the room. To gather the family ant make them stay for longer, there are six incredibly comfortable SAKARIAS chairs with armrests. The armrests with extra padding are comfortable to lean against, and the chairs can be pushed under the table so that they take up less space when not in use. Although there is no space for a separate dining room in this couple's apartment, their kitchen is roomy enough for an extra dining area. 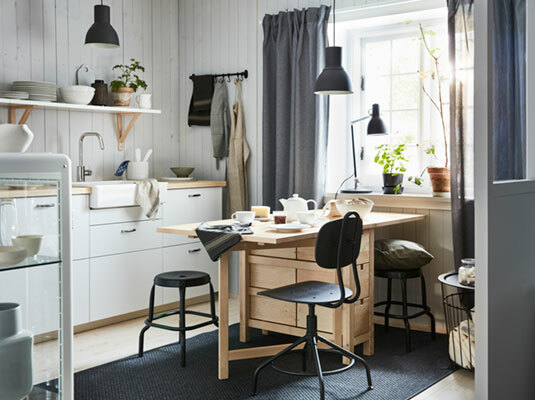 A traditional Scandinavian interior is filled with functional space-saving furniture: a NORDEN gateleg table with drop-leaves has a surface resistant to liquids, food stains, oil, heat, scratches and bumps. The 6 drawers under the table top can be used for cutlery, table napkins or candles. 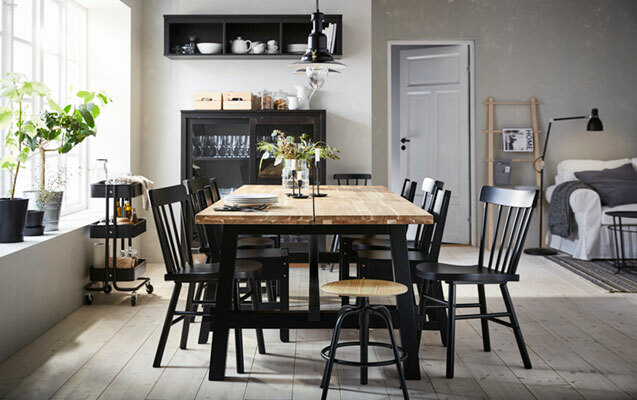 At the table, there are two easy-to-move RÅSKOG stools, and when the couple is waiting for guests, helps the KULLABERG swivel chair. Sometimes less is more. 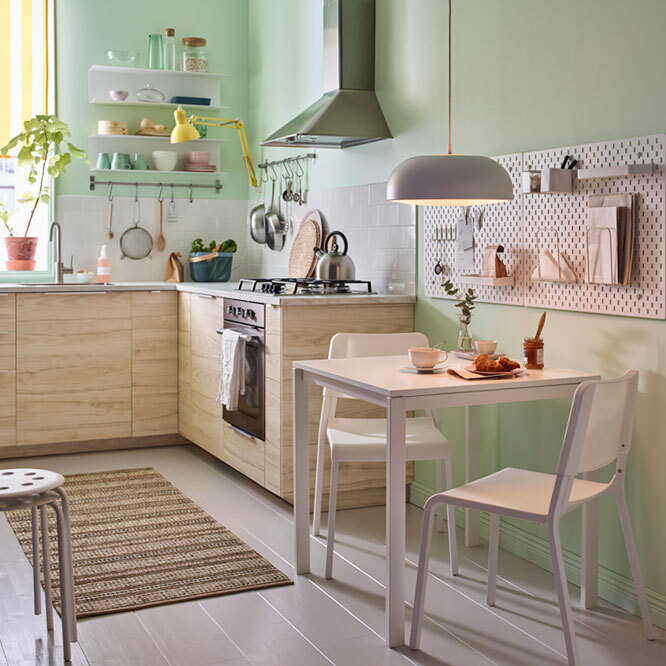 This small kitchen with dining area is here to prove it's true. The MELLTORP dining table here also serves for a desk and has plenty of room around for two or even four (if needed) TEODORES chairs. There also are some MARIUS stools that can be stacked and stored on the same space as one. The SKÅDIS pegboards on the wall help organise small things and always have them close at hand. This modern Scandinavian style apartment has plenty of room for a family who lives here and all their guests. The BJURSTA extendable dining table seats up to 8 persons, as its size can be adjusted according to need. The LEIFARNE chairs let sit comfortably thanks to the scooped seat and shaped back. Four MARIUS stools hidden under the TV bench are light and can be stacked, so you can keep several on hand. This country-house brings family together not only for weekends. The traditional Scandinavian interior is a great background for summer leisure, family feasts and Sunday lunch. Their dining room is spacious enough to find room for a long SKOGSTA dining table and NORRARYD chairs. And not only for them - there are more different models of chairs and stools. 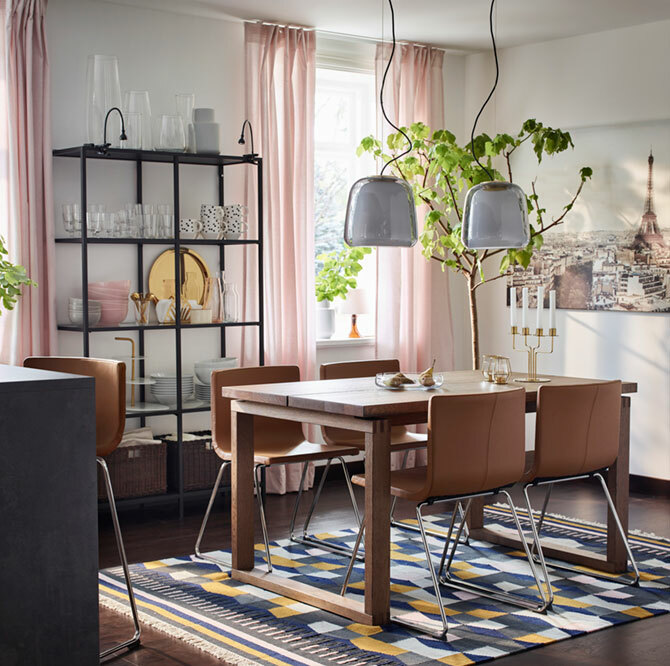 A couple with higher income appreciates quality and longevity of things, so their dining room is filled with durable modern style furniture, such as MÖRBYLÅNGA dining table in thick oak veneer and elegant BERNHARD chairs. The padded seats of these chairs are made of soft, hard-wearing and easy-care leather, which ages with grace. If you want to spend more time socialising with family, start around the dining table. The MÖRBYLÅNGA dining table in oak veneer has been tested against our strictest standards for stability, durability and safety to withstand everyday use in this family home for years. Together with VOLFGANG chairs and the restful flexibility of their padded seats, it creates a genuine Scandinavian interior. When you’re a big family, it’s all about creating space. Space for yourself and space to be together, often at the same time (and in the same room). 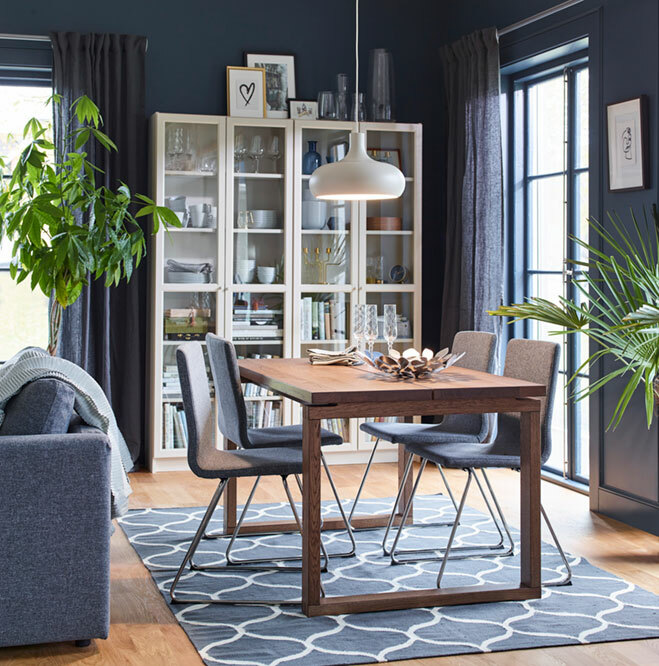 To make it comfortable for everyone, choose modern style dining room furniture, such as NORRÅKER dining table. And don’t be afraid to mix different styles of chairs, from a junior high chair to a classic adult chair, as mixing and matching gives the room character. Which one would you like to sit on today? 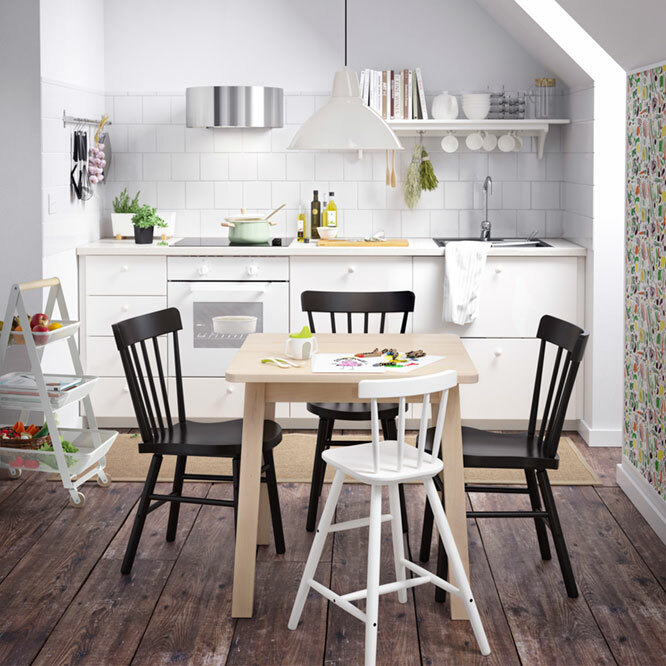 Can a small kitchen in a small apartment turn into a comfortable dining room for living with children? Of course. The AGAM junior chair gives the right seat height for the child at the dining table and matches perfectly to the modern style furniture, such as NORRARYD chairs and NORRÅKER table. The latter is durable, hard wearing and with rounded corners to ensure safety. This stylish dining room belongs to an elderly couple of artists. 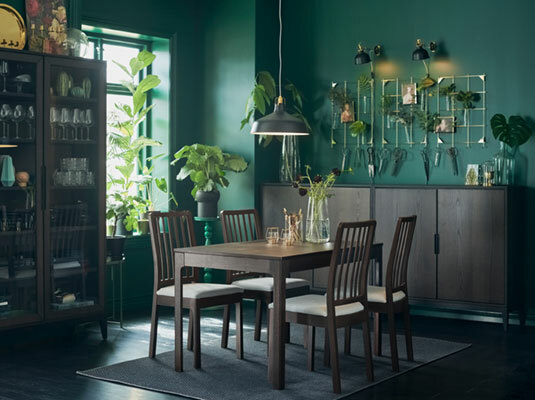 The moderately modern interior features green walls, golden accessories, such as frames, candlesticks or trays, and the EKEDALEN dining set in dark colour. The set includes an extendable table and four wooden chairs with comfortable angle of the backrest removable seat covers. An open living room with dining area is one of the most important rooms of this friendly house in the suburbs. There is plenty of space for the whole family, their relatives and friends. The living room is filled with bright, vivacious colours, while the dining room furniture is dark. 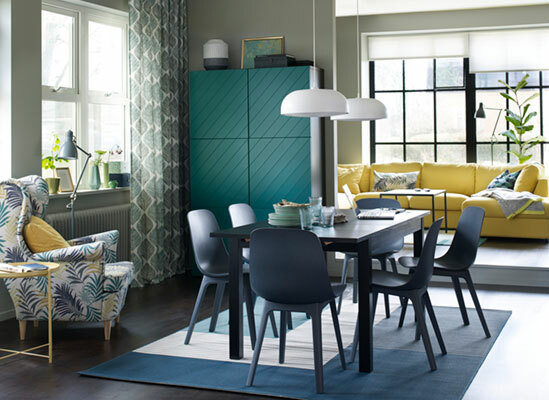 Here, a yellow modular sofa and a green BESTÅ storage combination meet a brown BJURSTA extendable table and dark blue ODGER chairs made of recycled plastic and wood.